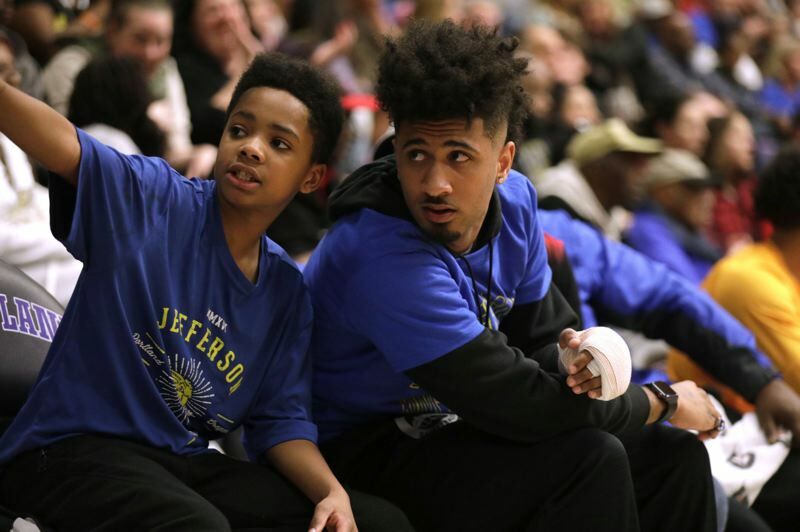 It might be awhile before we see a spectacle quite like the Grant-Jefferson boys basketball rivalry of 2018. But the memory of the final chapter, which unfolded Saturday night at Chiles Center, won't soon fade. 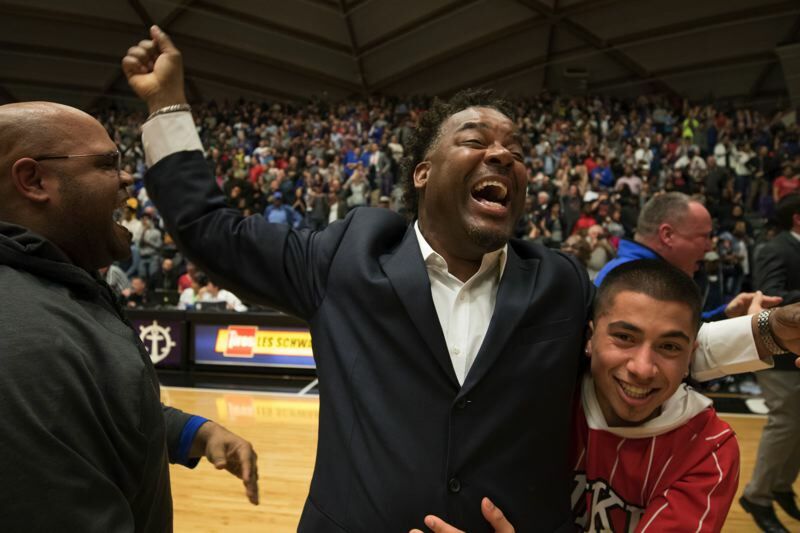 For the Grant Generals and their community, it will be a happy memory — that of a 63-62 final victory, the school's fifth state title and the first state crown in a decade. For the Jefferson Democrats and their followers, the team's only loss all season to a team from Oregon will sting. For the rest of us, it will live on as entertainment at its finest and as a reminder of how in the age of social media, there is still no matching the way live sports in front of passionate fans can invigorate. The story line entering the fourth meeting of the season between Jefferson and Grant included the Generals trying to flip the script after the Demos won the first three meetings of this season by a combined 10 points, one game in overtime. For the Democrats, there was motivation not only to repeat as state champs but to prove they could do it with PIL player of the year Marcus Tsohonis out with a broken finger. For three high-paced quarters the teams traded dunks and 3-point shots as players who grew up playing with and against one another provided end-to-end entertainment for more than 3,100 fans at Chiles Center. As the intensity ramped up in the fourth quarter, defense came to the forefront. Grant, which led by five points early in the fourth quarter, won despite scoring its final field goal with 4:29 remaining. The Generals prevailed despite missing four fourth-quarter foul shots — the winning margin provided by Ty Rankin's pressure-packed free throws with seven seconds remaining. Rankin had missed seven foul shots as Grant lost an 18-point lead and barely survived in a semifinal that went OT against rival Lincoln. The junior guard went to Irving Park after that game and shot "probably 100" free throws Friday night. He spent more time Saturday shooting free throws. "I knew that wasn't acceptable. That's not championship caliber, so I had to knock those down" with the title on the line, Rankin said. Jefferson had one final chance, but didn't get the shot it wanted. Democrats coach Pat Strickland wanted point guard Robert Ford to have the ball and use a screen to attack the basket. But the inbound pass went to Khalil Chatman. Chatman almost won the title for the Demo's on his own, scoring 30 points on 13-of-17 shots and grabbing 12 rebounds. But as he dribbled toward the top of the key, Grant's Aaron Deloney was ready. "He was having a huge game. I knew he was going to attack the basket," Deloney said. "I just got a quick swipe at the ball and got a piece of it." Ford grabbed the loose ball, but all he could do was flip a desperate underhand shot over the defense of Darius Guinn. If there was an unsung hero for Grant, it was Guinn, who was challenged by coach Robert Key to defend Chatman one-on-one in the second half. He also took a couple of key charging fouls, including one on Jeff's Keylin Vance with 2:55 left in the game. "That's what I'm known for. I'm the defensive guy," Guinn said. "I knew that they were driving hard all game. I was going to take one for the team." Guinn and Kelton Samore had their hands full with Chatman and Kamaka Hepa, who led Jefferson to a 37-27 rebounding edge. "They're great players," Guinn said of Hepa and Chatman. "Down the stretch, me and Kelton were telling each other, 'Box out and we win the game.' That's all that was on our mind. Samore finished with 11 rebounds, but his biggest grab came with 15 seconds left when he went to the floor to grab a loose ball, saving a potential Grant turnover with Jeff up a point. After that timeout, Deloney was thinking shot as he came off a screen. But when a defender came to help, he got the ball to the open Rankin who drew a foul then hit the two foul shots that will live in Grant basketball lore. For Key, too, the win seemed a long time coming. In 2007 his Roosevelt team lost in the 5A championship game, and over the past two seasons his Generals have lost seven times to Jefferson. As the celebration continued on the Chiles Center floor, Key talked about how his team kept its eye on the prize through three tough losses to the Democrats. "They were total focus throughout the whole year," Key said. "Through adversity, they understood. They stayed the course and stayed together and played for each other." Grant's Deloney and Lincoln's Bryce Sloan were unanimous choices for the all-tournament first team, joined by Grant's Samore and Jefferson's Chatman and Hepa. Rankin was named to the second team. Given the nature of high school basketball, where transfers happen each season, it is impossible to predict what these teams will be next season. Five of the seven players in Grant's rotation are seniors — though Rankin and Deloney will be seniors next season. Jefferson's Hepa is bound for Texas to begin his college career. Chatman, Ford, K'lum Strickland and Romeo Akil also move on. Tsohonis, who had surgery on Friday on his broken finger, Jalen Brown and Keylin Vance should be a fun offensive backcourt for the Demos in 2018-19. 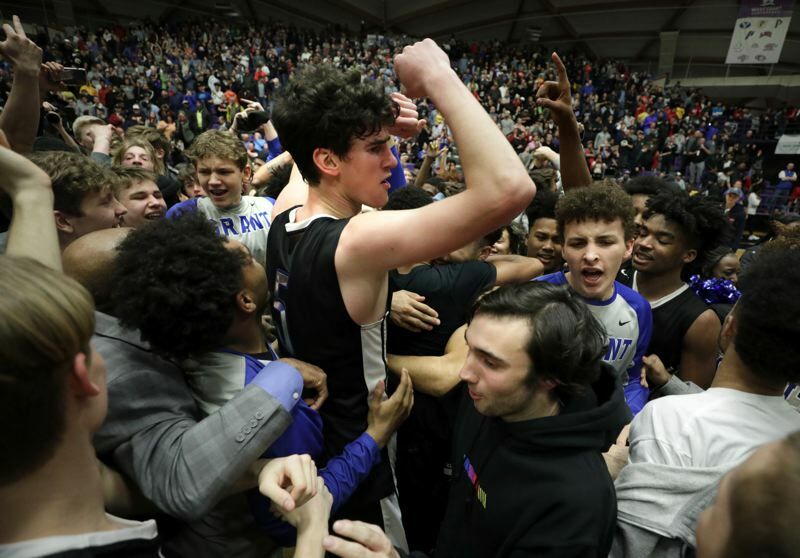 Saturday's championship was a crowning moment for the Portland Interscholastic League, which can brag about a 1-2-3 finish at the tournament, with Lincoln earning third place. 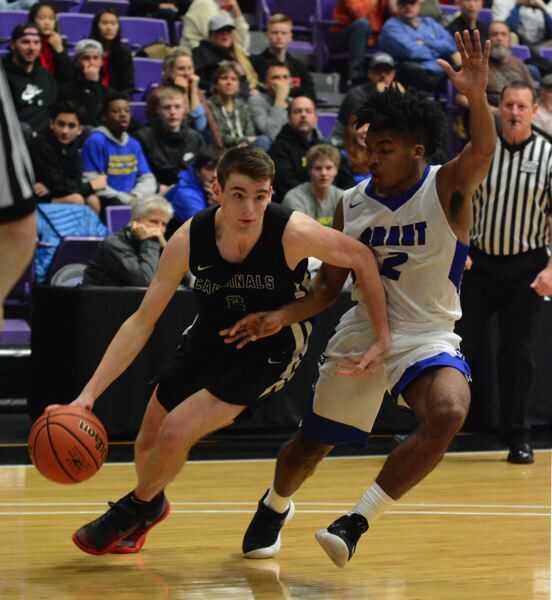 • The resiliency of Lincoln was on full display at Chiles Center, both in rallying from 18 down to take Grant to overtime in the semifinals and in rallying from 13 down on Saturday and scoring the last eight points to beat Barlow and give the PIL its 1-2-3 finish. "It was amazing to me," coach Pat Adelman said. Not that Adelman doubted his team would respond, but especially after the tough loss to rival Grant in Friday's semifinal the coach wasn't sure how much energy his guys would bring on Saturday. Lincoln senior Bryce Sloan was a unanimous first-team all-tournament selection. Adelman says the 6-4 Sloan, who averaged 21 points in the three tournament games, has not drawn interest from any NCAA Division I college program. Noting that Sloan had so much responsibility besides scoring for the Cardinals and said: "If I was a Division I recruiter, I'd be all over him." Lincoln graduates a senior class that includes starters Sloan, Addison Phillips and Aidan Anastas. Key returning players will be Daniel Kovalev and Max Weissflog. Kovalev was a driving force, particularly in Saturday's third-place game, when the guard scored 16 points, grabbed five rebounds and made a huge steal for the go-ahead basket in the final minute. Lincoln's finish might have been even better had the versatile 6-3 Weissflog not hurt his ankle in the second quarter of the semifinal. The sophomore had seven points in 12 minutes before the injury.